Math art projects like this Pi Skyline are my favorite way to get my older son’s creative juices flowing. It’s also a great Pi Day activity! My little math nerd loves making tessellations, spirolaterals, drawing with a compass and other math tools. The idea of creating a cityscape out of graphing the numbers in pi was something we invented last year to celebrate Pi Day (March 14). We tried it again this past week and Kiddo was even more into it! Pi, or π, is the ratio of the circumference of a circle to the diameter. 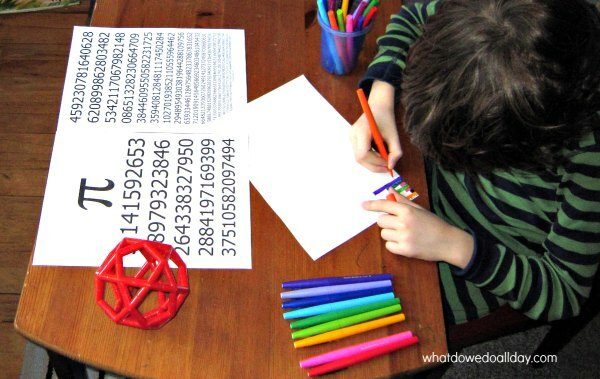 It is an irrational number, a little mystifying and a whole lot of fun to use in art. A printout of pi. I used this one at 10 Minute Math. I worked alongside Kiddo on my own pi day skyline for a while. It helps focus him on an art project if I work next to him. I used watercolors to create a night sky and river and glued my cut out shadow city on to it. You can’t tell much in the photo, but I like how the two rows of graph paper form the base of the city. Plus don’t forget the pi stars for a little “pi in the sky”! Watercolor palette. I love how many colors there are!! Faber Castell Pitt Artist Brush Pens. These are by far my favorite markers ever. They come in several widths and all sizes are glorious to use. The ones in the video are the Big Brush size. Watercolor brush pens. These are an interesting way to switch things up. Prismacolor premier markers. These are waterproof and I like to use them when I use watercolors. They are a nice alternative to Sharpies, and the dual tip ends make them more useful. Strathmore Visual Journal Mixed Media. We have tons of these. I have written about them several times on this blog. You can’t go wrong with this art journal. If you look closely you can see the stars are actually π. π in the sky, my friends. There are so many ways you could adapt this. 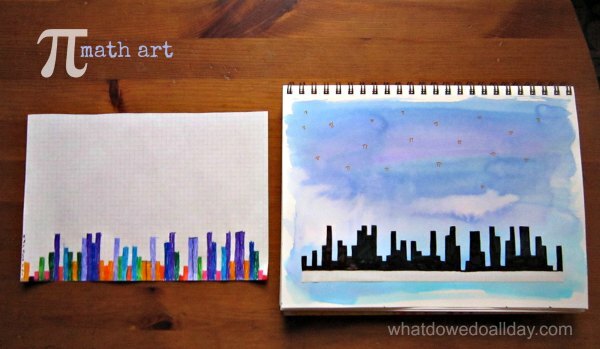 Glue squares of paper to create a collage cityscape of pi, or use paints, watercolors, or even sculpt it. You could even use LEGO to build a 3D version! I think buildings made with different colored squares corresponding to pi would be awesome! Make a paper chain or beaded necklace in which each color in the chain represents a number. Have a contest to see who can memorize the most numbers in pi. We did this last year and Kiddo beat me handily. 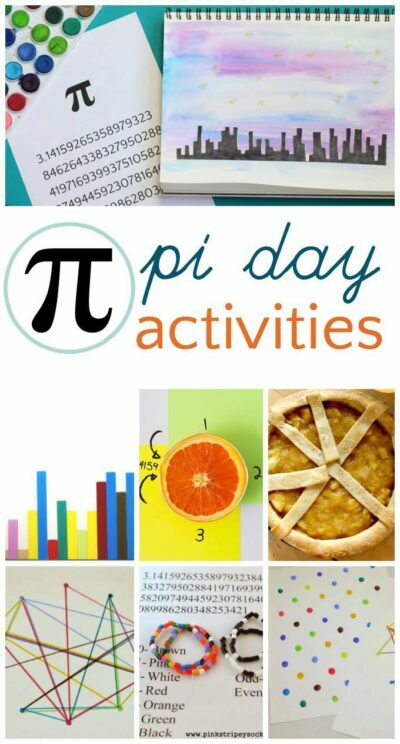 See our full list of pi day activities. 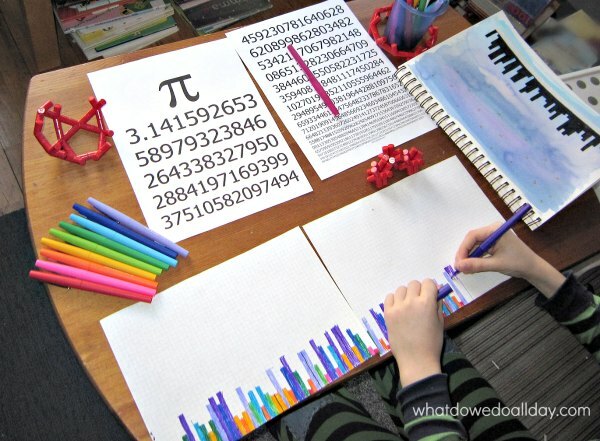 Show your kids these awesome color visualizations of π data. Oh, I love that skyline! 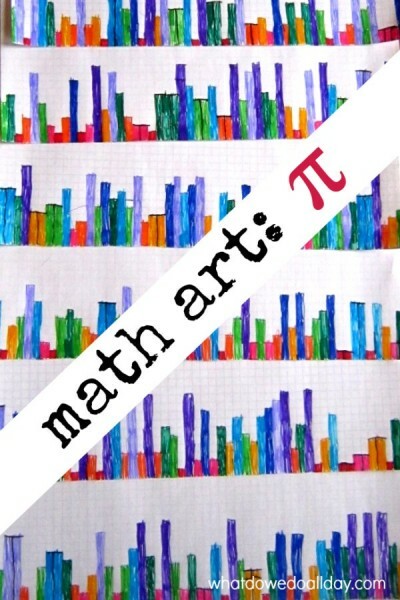 I think I need to do this math art activity to help refresh my understanding! I can’t really remember when I learned about it either. Probably in high school as well, but then I wasn’t a math geek like my son! Oh! So HE’s the one that wanted to learn Pi! lol Here I thought it was something else expected of young children, across the board. Wow, I wonder what he’s going to be when he grows up! He’s been fascinated by numbers since the age of 2. I love how geeky you are! This is an awesome idea Erica! Erica this turned out so great! I can’t wait to try this with my daughter for Pi Day. Thanks for sharing. What a fun idea!! I love it! I’ve actually never read it but there is Sir Cumference and the Dragon of Pi. I should have said, we read that one a few years ago and were NOT impressed. 🙁 The mathematician family didn’t like it either but had no others to suggest. Perhaps your son will write one some day! Love-love this post. You just HAVE to join into We Love Math blog hop with this post 🙂 And what an awesome idea to graph Pi like that. I am adding this post to my upcoming math round up for the next week. Love the Skyline Pi! We’re celebrating Pi Month! It’s 3.14 all of March :-D. We just made some wall art tracing circular objects around our house and wrote as many digits that my 4 year old had the patience to write. That sounds fun, too! I love that it is also Pi Month! So cool! This is brilliant and beautiful! What a great way to teach Pi. Thank you! We had so much fun with it. Pardon for the intrusion. I was wondering if you ever feature interesting and novel pi products on your blog? I figured I’d check in with you via email rather than cluttering up your blog with a comment. Specifically, my company offers a Digits of Pi poster with almost 6 million digits. Millions more digits than other posters on the market. It’s a printing marvel and also a tribute to the computation of pi to almost 6 million digits. What also makes it different is that a magnifier is required to view the pi digits, which makes it really fun and interactive. It’s a tool to spark a student’s interest in pi by having them search for repeating patterns of the digits in the poster. Let me know and I can send additional info. It looks interesting, but it’s not right for the blog right now. I’ll let you know if I change my mind! This is soo great! Thanks for sharing such a creative craft for math lovers. LOVE your skyline! I snickered a little at Pi in the Sky, lol. 🙂 Pinning! Ha! That’s sort of my favorite part! Where did you get the pi stickers? I didn’t use pi stickers. I wonder if you are talking about the pi in the sky? I drew those. So glad it was a hit, and thanks for stopping by to let me know! What a terrific way to incorporate two S.T.E.A.M. elements into a program for my elementary kiddos at my library. As a youth services programmer, I am always looking for unique projects with that “STEAM-Y” element. Thanks for the post. I’m so glad you like it. This was one of my all time favorite projects. Hi, I love the pi in the skyline art project! I would like to do that as a Pi Day activity in our Library this coming March. Would you mind if I used your watercolor photo in our promotion if I credit your website? What a great post – thanks for your ideas and all your links (for this and myriad other topics!). I incorporated many of them into a program at my library http://carolsimonlevin.blogspot.com/2016/03/pi-day.html — we had kids from age 4-12 and everyone had a lot of fun. I also promoted your site last week in a special post I did to advertise the program: http://bwlibys.blogspot.com/2016/03/make-math-fun-with-books-programs-at.html. Hope you are ok with the cut & pasting…if it is a problem, I will take it down. Wonderful, thank you for telling me! Super fun – fantastic idea!!!! 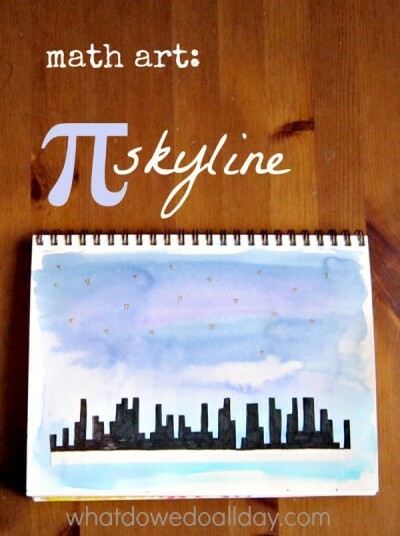 Although this is a fun art activity the mathematics of doing a pi skyline is inaccurate. The 3 in 3.14 is three wholes and should be 30 times larger than 1/10. The skyline does not mathematically represent the number pi. Please stop promoting this inaccurate mathematical represenation. Instead find a way to promote that pi is the relationship between the diameter and circumference of a circle. All people who care about mathematical accuracy (i.e. Mathematical Practice #6: Attend to precision).